In a blog post today, Valve announced a pretty simple change to the way Steam games get a review score, to help with review bombing. What is Review Bombing? To put it simply, tons of users going to a Steam page and leaving a negative review that's not always to do with the actual game in question. It's been something of a hot topic, since it became a tool for users to show their feelings about various things, most of the time something directed at the developer or publisher. 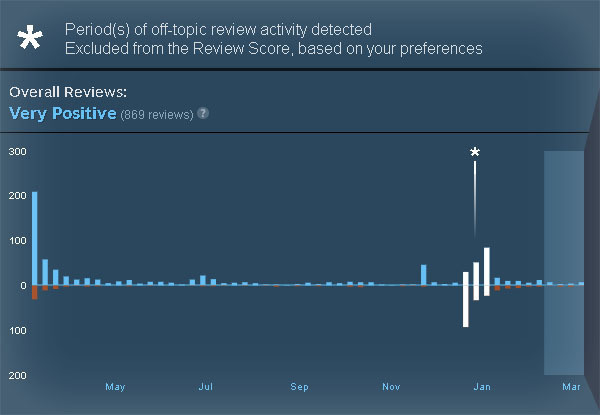 A recent example, would be how the Metro games on Steam got waves of negative reviews when Metro Exodus was announced as a timed-exclusive on the Epic Store. So what are Valve doing? Well, they're going to remove what they say are 'off-topic review bombs' from the overall review score for that time period. However, the reviews themselves will still be left up for all to read and users on Steam can actually opt out of this removal system to continue seeing a review bomb as normal. In a two question Q&A at the end of the blog post, Valve also mentioned a flaw in the system being that any review made during this period will no longer count if you leave this system turned on, which presumably means positive reviews too. Valve did say they're working on "some other features around User Reviews" but they wanted to get this out as they thought it was "worth shipping by itself". This is not a AAA game by all means. It really got review bombed without a valid reason. Q: Does this mean you'll be going back to identify and remove old off-topic review bombs? A: Based on internal conversations and consultation with some of the partners that have experienced off-topic review bombs, we decided not to unilaterally grandfather in what's happened in the past. Fair enough. This Question does not appear at the News displayed when I go to steam. It always displays the German version (web and client) which only has two Q&A. Well, I guess we now should wait for the first review bombs to happen and see if this system works. Btw. it's really easy to Show the filtered Reviews. It's more easy than usually and with a few clicks you can see why a game was review bombed. Just look for a star in the review score and click on it and from there go further. This even helps pro-review-Bombers. You will be very quickly able so see if a game was bombed because some stupid Youtuber or DRM or Microtransactions and decide accordingly. stuff Another example being Shadow of the Tomb Raider because it got a sale soon after release. Hmm, but every one looking at the game a few month after release, will see a negative rating. And this does not help these customers. They want to know if the game is good if it is fun to play. They do not care, if someone thinks, the game was lowered in price to early. So it is a point of view. If I want to inform me, if the game is fun to play - what does the reviews help me, that rate the game down, just because it was going cheap to early (and this is just a feeling of the ones, who bought it at a higher price). The act of lowering prematurely is still present. People who bought it early were paying for a service they didn't get (exclusivity in exchange for money, they lack money and exclusivity, theft?). This is not some subjective metric, you can compare all AAA games in last several years and look at how long it should remain at the top price. Weren't last Battlefield and Fallout just weeks after release hugely discounted? Right there, that is anti-consumer and in my opinion should reflect rating of a game, because if they pulled such scam once, people should expect to pull it again and this (rating and reviews) can warn new customers against scummy practices. I am for everything being on-topic, because seeing how Valve is incompetent - saying DRM and EULA are OFF-TOPIC and not part of a game (WTF? DRM is literally part of a game and EULA must be accepted before playing, so, in my view, part as well). I don't trust them to not **** up, because they have several times already. Hey, I think you miss the main point, nothing is censored, you can see everything and you can decide, if you want these reviews to be counted or not! monnef I am simply stating that buyers after release are paying for time-limited exclusivity, for a new game to experience it first and for some time. Huh. When I buy a game, I'm paying so I can play a game. I don't approve of positional goods where someone pays in the hope that other people won't be able to. Seems kind of dickish to me. But you know, under the new Steam policy I can still read the reviews explaining why lower-income lowlives like myself shouldn't be able to afford the game yet and why it's terrible that the general guideline that the proles should be kept out for a while was violated, and I can click a setting to see what the rating of the game would be with those complaints factored in. And if I'm persuaded I can then refrain from buying the game, or at least wait a decent while for the upper middle class to enjoy the snob value of the product before I muddy the waters with my economically unworthy feet. So worry not, the new policy still allows that sort of review bomb all the influence it deserves. Wow. So many people go nuts about something that can be configured. Steam shows how this should be done so that everyone gets what they want, but some people blindly assume that something has been taken away from them and go nuts. For those people, it doesn't seem to make sense to actually read if their fear is true. I'm sure there will be people review-bombing Valves games because of that. In their view, they show how right they are about their behavior. In my view, they show that this configurable feature is needed. In the case of the video you posted, I will admit that I didn't bother watching it. But from the title and the past experience that I had there, I can draw some conclusions. In any case I think we can all agree (I hope) that review bombs are, to say the least, unorthodox. Sure they are a normal and natural response from the disappointed masses, but it's very ineffective and often causes a lot of collateral damage. The term "bomb" actually fits there very well. It's like using nukes, except it's not a real, physical war going on. As much as I hate greedy publishers or questionable or outright anti-consumer practices on behalf of publishers / developers, I have to say that review bombs are not something that can go on forever, and they are certainly not the answer to any problem. Remember that you can't fight fire with fire. We need a more appropriate and more fair approach to hold such the responsible companies accountable for their actions. Instead of going to review negatively all the past games, even though they are good and historically they had good ratings (they fully deserved them), we could, I don't know, review the publisher / developer directly? Or some other way to express our frustration. Because right now we're throwing it in the wrong direction. There are many people who actually sweated hard while working to make those games, who put their passion into them. Those people almost assuredly had nothing to do with the decision to put the game on store A or store B or to make it exclusive. Not to mention that some of them might not be even working there anymore. But they do care about their hard work, which resulted in something good, something loved, something special, something which countless people now mock. It doesn't seem fair at all. Another this is that Valve actually needs to stop non-legitimate review bombs. If a game changes a lot into something that the players don't like, and they review it badly immediately, that's fine, it's an accurate representation of how people fell about that particular game at that particular moment. But if people review bomb anything for any reason, then there's a problem. You have to understand that your idea of what is considered "legitimate" is different from each other person's idea. Some might consider even the most absurd reasons as legitimate, and they would really believe that they are so. The real problem is that if this continues to happen, and it happens often and for no good reasons (really good reasons, like, as I said before, reasons related to the actual game) then the whole reviews system will be unreliable. What is an average person supposed to believe, when he plans to buy a game, looks at it and it's, say 90% positive, and when he looks the next day it dropped all the way to, say, 60%. That person doesn't know about what the publisher did. That person probably doesn't even know what the role of a publisher is. That person doesn't care. And more importantly, that person is exactly how the vast majority of the users are. So yeah, here's another collateral victim of the review bombs - Valve. And that person who wanted to buy the game but is now confused? Yep, he's a victim too. And I'm gonna leave with a question: What would happen, if we, as Linux gamers, would review bomb all the games of a developer who cancels a promised Linux port, or removes a port after it's been up for a while? Surely it's a "legitimate" reason, right? Right? And an extra: What would Windows (or Mac) users think about us? Would they care about our cause, however noble it might be? Hori Remember that you can't fight fire with fire. You can, actually. It's a well known technique in fighting forest fires to do a hopefully controlled burn somewhere the main forest fire will be passing through, to get rid of the fuel. And in general it is often perfectly practical and appropriate to fight a set of tactics by using similar tactics. If you're sitting at a chess board and somebody starts making chess moves at you, you can fight them by making chess moves back. And I do think review bombing, although it seems often abused, has a place. Which is why I'm glad Valve are doing this the way they're doing it--not taking down the actual reviews, and allowing you to access what the review score with review bombs would be if you're interested. I would actually be upset if, say, the policy was that reviews identified as part of a review bomb were taken down. That would be bad. Bit confused by this.. I already don't give any credit to people who have spent very little time actually playing the game. Why can't valve use that? There certainly is an argument to be made about updates breaking games or games that are outright DOA. It also only takes a streamer or two complaining before you'd see the same kind of swarm activity as you would a malicious botnet. devnull Bit confused by this.. I already don't give any credit to people who have spent very little time actually playing the game. Why can't valve use that? There's games where you can say you'll never like it in half an hour or less.